Enjoy a lifestyle immersed in luxurious amenities that have garnered praise throughout the world. Without stepping outside of the building, indulge a Michelin-rated restaurant, an internationally acclaimed spa, and a panoramic outdoor terrace all enveloped in revered customer service. As you return home to the shining tower that has established its place as the new pillar of Chicago's skyline, be welcomed by door staff who will assist with your needs whether they be related to parking, package deliveries, or guest arrivals. Settled into your home, enjoy an exclusive perspective from the floor plan you've chosen to match your lifestyle. Relax, refresh, lounge, or entertain in your personalized space. 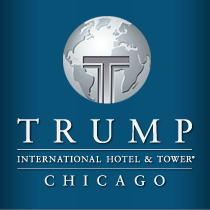 When the time comes to explore the best that Chicago offers, start within the tower. The Spa at Trump awaits on the 14th floor, featuring a 75' temperature controlled swimming pool award-winning spa as well as extensive fitness center facilities, exercise classes, and optional personal training services. Sixteen restaurant, Rebar lounge, and The Terrace at Trump feature drinks and dining in an array of settings suitable to any mood. Additional outdoor spaces incorporate over an acre of park space featuring a dog park, lily pond, and premier shopping along three floors of riverwalk shops.